On Microsoft's MSDN blog, the company has revealed in great detail some of the changes we can expect to see to boot options inherent in Windows 8. Most notably, gone are the days of tapping F8 repeatedly. Also gone is the classic, keyboard-driven advanced options menu that has delivered us all to Safe Mode at some point or another and in its stead is a straight-forward, redesigned GUI. Windows 8 boots fast. Really fast. On a modern system, it boots so quickly there simply isn't time for a keystroke interrupt -- such an interrupt would normally allow users to invoke a fail-safe menu by tapping F8. Of course, this is particularly worrisome for users who find themselves needing to boot into Safe Mode or may otherwise be experiencing issues. Microsoft engineers decided to tackle this issue utilizing a multi-pronged solution. Their new approach gives users access to advanced startup options, but without all that rapid F8 tapping nonsense. Firstly, if Windows 8 detects a serious error, it will interrupt the boot process automatically and display advanced boot options. This is not unlike what Windows does already. Secondly, the menu can be explicitly called upon (even automatically) via your computer's UEFI firmware. The third and final option is invoking the menu through Windows itself. One such method is done by booting into Windows 8 and holding shift while clicking restart. Alternatively, you can navigate the Start Menu options for it. Along with changing the advanced boot menu's behavior, Microsoft has redesigned the menu entirely. These advanced options will now include everything a user might expect in a sensible GUI, including quick access to System Restore, System Image Recovery, command prompt and Windows 8 startup settings. I must admit, when I first stumbled upon this article I was waiting for a "hold this key during boot" solution similar to Apple computers. Seems like an obvious enough fix, right? However, Microsoft chose not to do it this. 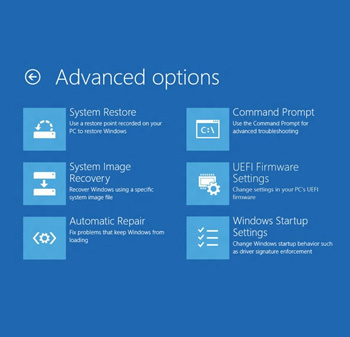 As a result, it appears the only way to boot into Safe Mode and so on will be to either configure your UEFI firmware to display those advanced boot options or load up into Windows 8 first, tell Windows you want to reboot into the advanced boot options menu and restart the computer. Personally, I find not being able to invoke the menu with a key during boot cumbersome. Microsoft makes a decent point though: they chose not to do this because Windows 8 will also appear on touchscreen devices that have no physical keyboard. What do you think?